Last week we took a trip to Ikea on the hunt for a new bookcase. The area in mind is pictured above how it is now, and on Instagram you can see how it was before. We had a short black bookcase that has now been moved into our art studio/home office. It took some convincing, but I finally persuaded S that we needed a white bookcase to brighten up this space. It's on a wall with 2 windows and our sliding glass door, so light never directly hits it. Our items definitely needed some encouragement like a white base in ordered to be displayed beautifully. 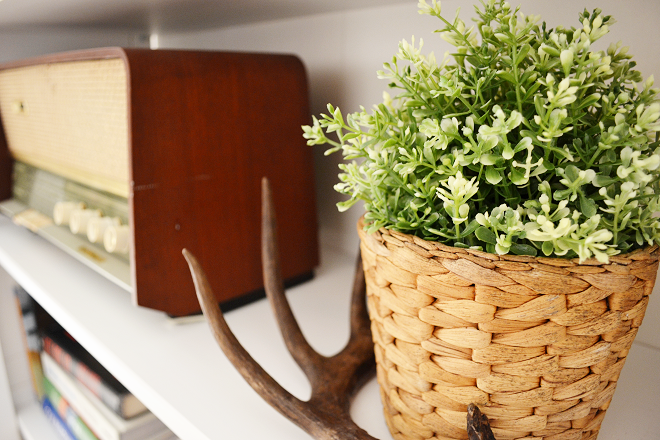 In the second photo, you can see one of our favorite oddities: a blackened deer antler. It's the only dark deer antler that we have, and we have over 25 pounds of antlers. Most antlers become white by being naturally bleached by the sun. 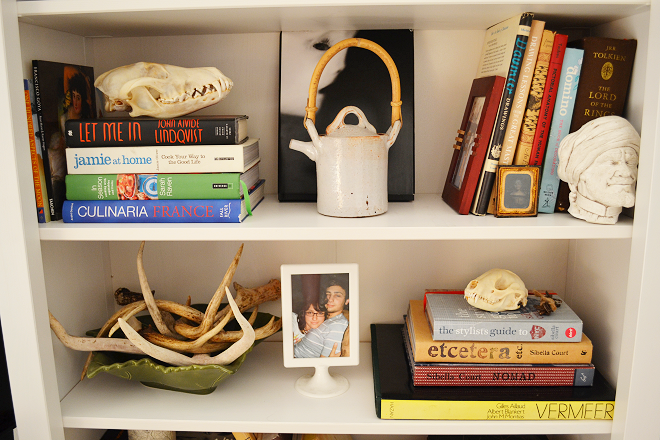 On a lower shelf, with our coyote skull from Evolution on our last trip to New York, we have a bowl of antlers - displayed like most antique shops display their antlers. 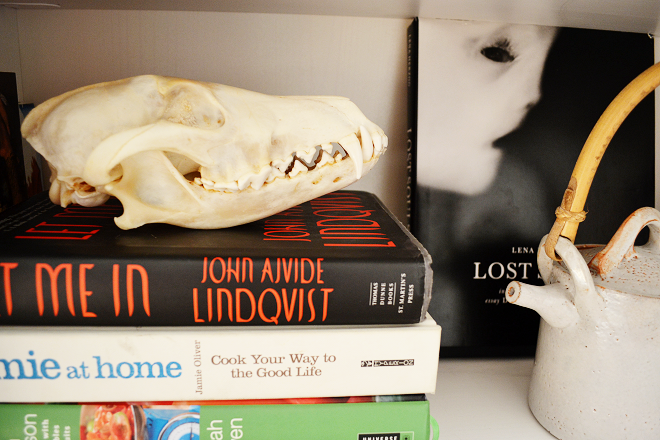 Holding up our animal skulls are some of my favorite cook books like Jamie At Home and on the other shelf, my favorite decorating books by Sibella Court. 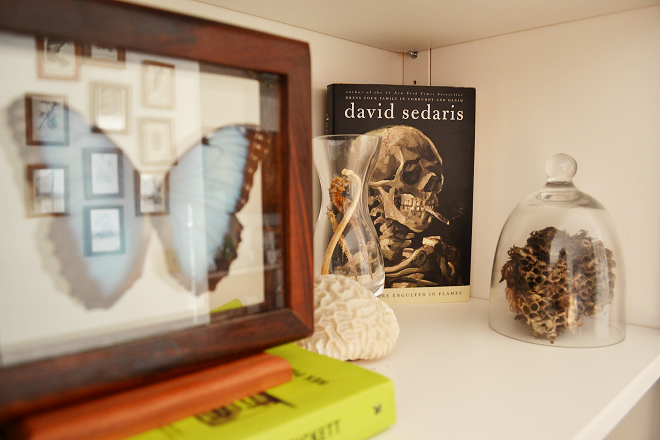 No book shelf would be complete without a David Sedaris book. It's accompanied by my blue morpho butterfly that I got on my trip to Costa Rica a few years ago, our sea horse skeletons from the sponge docks, and under a bell jar is an abandoned bee hive. I have such a love for abandoned items like antlers, bee hives, and theme parks. There must be something inside of me that wants to take them home when I can and help the items keep their worth for one more generation. Another favorite item displayed proudly on this shelf is our old tube radio. We found it at an antique shop and it sounds as beautiful as I imagine it did years ago. It's the kind of radio that takes a minute to warm up. We'll turn it on and then go into the kitchen to make dinner. Slowly, in the background we'll hear the voices of visitors, forgetting that minutes ago we tuned into NPR. It has such a deep and warm sound which makes it my favorite old radio that we have (we own 3!). 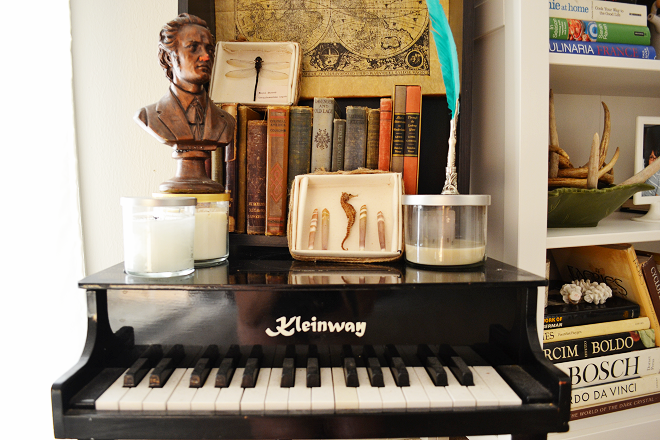 Next to our new bookcase is our little old piano, the only kind of piano that fits inside of a 2 bedroom apartment. Atop the piano is a bust of Chopin (fitting, no? ), sea urchin spines with another sea horse, an old map, and a pile of old books that S once gave me as a gift. I feel like all of our items are displayed much more proudly in this bookcase. In the previous black one, the items got lost and ignored. 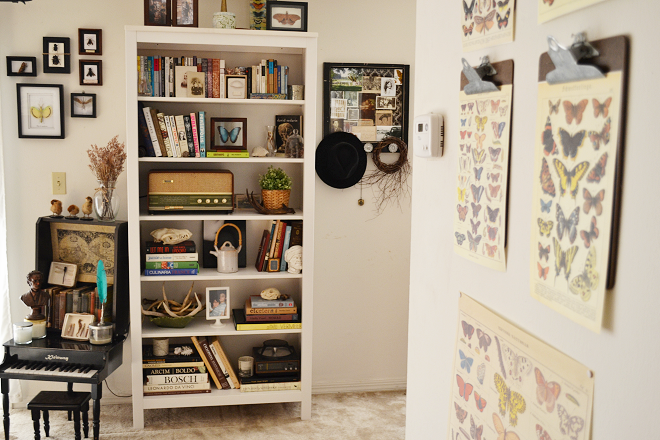 This is a way to show off all of our favorite items, our own little cabinet of curiosities. 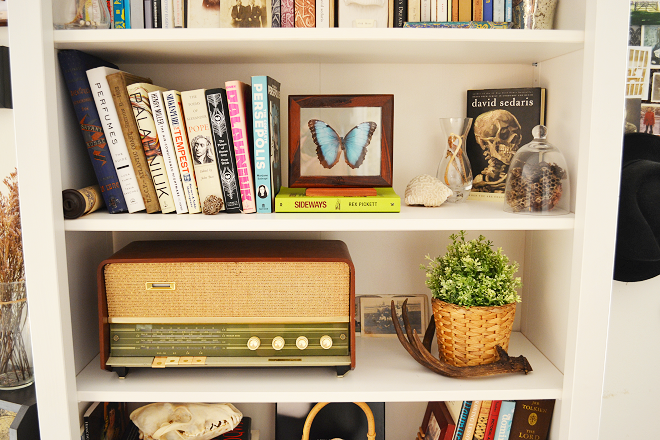 I like how you've got both books and curios in your bookcase. It makes the arrangement feel so relaxed and lived in, a place to display collections as opposed to cramming as many books as you can in it! I currently have too few places to store my too many things, so I'm sporting more of the "cramming" look in my home these days. I keep dreaming up little projects for Ephraim's house for when I move in, and for the time being, the dreaming is enough. I can't wait to put those plans into action though! I hope we manage to make some of the house feel as bright and airy as your living room! What a nice collection of items! I love this space because it feels so interesting and romantic. The butterflies are especially intriguing to me. As a little girl, I used to want to collect butterflies and moths like yours. Thank you for sharing your space! You have such a knack for curating wonderful little curiosities! Fitz loves deer antlers, they sell them at some of the nicer pet supply stores once they're dried, and he chews them down. He'd go crazy for that bowl of them! I love the little bust of Chopin. You have a really great style, and it eeks out of everything you have on display. I love that picture of you and S, too! P.S. Be sure to check out or huge giveaway today! 2 winners! + a discount code. Wow, this is seriously amazing! Lovely space! I love it. You've styled everything wonderfully, which I admire because it's something I'm still working on. I love how you put everything together in this room...each piece is so unique! that piano! i am dying inside right now i would love to have one exactly like that, not that i would know how to use it but it's just beautiful. and, yes, you are such a curator. i wish i had your natural abilities. it looks great and i think the choice for white was a good one, it makes everything pop. You have a beautiful home! There's so many interesting knickknacks that make it special! Love the all the books, butterflies, antlers, and the piano! You have such a unique collection of items. I think the bookcase is the perfect display for it (and you are right, it does brighten things up). Now following you on Instagram! loving all your lttle knickknacks, of course wonderfully presented in your new white case. hope you're loving it! So so so cute! Super happy I found your blog! I am in love with your decor!